The military expertise of Saint Demetrios led Galerius, as Caesar of the Eastern Empire, to appoint him commander of the Roman forces in Thessaly and Proconsul for Hellas. But for all this, Demetrios remained ever aware of the underlying realities of life. Since faith in Christ had touched his heart, all the glory of this world meant nothing to him, and there was nothing he preferred to teaching and preaching the word of God, despite the persecution. at Thessalonica to receive the acclamations of the populace and to offer sacrifices in thanksgiving to the idols. A number of pagans, envious of the success of the Saint, took advantage of the Emperor's presence in the city to denounce Demetrios as a Christian. Maximian's astonishment gave way to violent indignation when he was told that Demetrios' was making use of his official position to spread the faith. 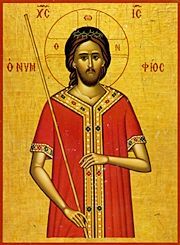 Demetrios was summoned and confined in a cell, located in the basement of nearby baths.directed against Christians by the Emperor, Saint Demetrios brought a large number of pagans to the faith. His words convinced them because they saw in the righteousness, peace and brotherly love that marked his life an illustration of the truth of which he spoke. It was God's will that the grace with which He filled Saint Demetrios should remain active even after his death. This is why He caused to flow from his body a myron with a delightful scent, which had the property of healing all who took it as an unction, with faith in the intercession of the Saint. Time and again, during sixteen hundred years, Saint Demetrios has given proof of his benevolent care for the city of Thessalonica and its inhabitants. He has defended them from the attacks of barbarians, he has preserved them from plague and famine, healed the sick and comforted the afflicted. buried the Saint's body.